Inside face of guide rail matches with edge of conveyor chain. The guide rail material is ultra-high molecular weight polyethylene with a galvanized steel back channel for durability. The guide rail comes in both 1.25" (31.8mm) and 2.25" (57.2mm) widths. This option permits transfer onto and off of the ends of the conveyor. These units lift out and are held in place by gravity as a safety feature to prevent objects from becoming lodged between the conveyor chain and the transfer rollers. The transfer uses small acetal rollers mounted on 4mm stainless steel rods. The unit is pitch adjustable from level to -15° at the discharge end and from +15° to level on the load end. This is a frequency inverter built into the conduit box of the drive motor, with no external wiring other than your incoming power lines. 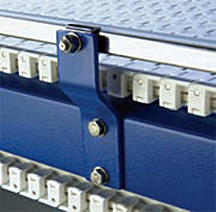 Movimot® provides you with the lowest cost method of controlling the speed of your conveyor. The unit is capable of 200 to 500 volts AC and has a frequency range of 20 to 80 hertz. The unit features an integrated potentiometer for setting acceleration and deceleration times. It is IP65 hose proof/dust proof enclosed. The WhisperTrax Slave Drive unit is available for plain and raised style chains. This option allows two different conveyors to be driven by a single gearmotor. Consult a WhisperTrax representative for compatibility with your system. Made of plastic with a steel reinforced core and non-slip pad attached to the underside of the foot, these feet provide a freestanding support for the conveyor frame. Foot option increases top of chain elevation 5" (127mm). 4" (100mm) diameter locking caster for mounting on the conveyor leg. As a safety limitation, not available on conveyors weighing more than 800 lbs. (364 kilos). Foot option increases top of chain elevation 5" (127mm). The maximum conveyor height is 47" (119.4cm) for casters. Painted mild steel brackets bolt to the side of the conveyor frame and support your system on 5/8" (15mm) hanger rods.